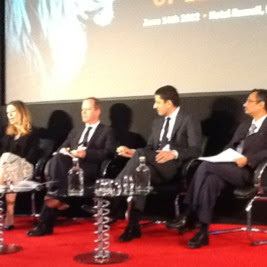 Angela Baron (CIPD) - Social media is changing the concept of communication from two way to multi-way. We no longer commentate, we take part in the discussion. Gareth Jones - Conversation's the new currency. Jon Ingham - Social media as facilitator – Focus on the outcome not the usage. 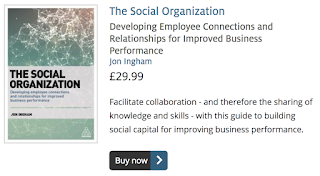 “In my piece in the CIPD report ‘Harnessing Social Media for Organisational Effectiveness’ I focus on social capital and the opportunities social media provides to create this type of people-related outcome. I thought it might be useful to post here about why I think this is an important focus. I was also talking about this yesterday in a session on learning and development earlier this where I suggested that social learning is important partly because it’s a more efficient and effective way to learn (activity), but also because it’s the only possible way – vs individual learning – to develop a learning team, community or organisation (social outcome). I’m really pleased this perspective on HR’s use of social media is starting to become better understood – does it work for you too? It’s a good suggestion with an element of truth and has also got me thinking because I’m shortly going to be inputting on a panel from the other side of the fence (not sure if that’s a mixed metaphor or not!). This is a session on 19th July being organised by Monster, with Keith Robinson of HR Buzz, which will be the first of a series of sessions called Monster Buzz. This one will also feature Isabella Hung at TMS, Lee Moody from Rank, Matthew Jeffery from Autodesk, Marilyn Davidson from APSCo and Steve McNally from The Equality Law Group. 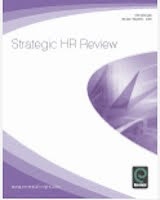 The first thing to note is that this is obviously a rather theoretical question – in practice you need to do both - the HR Magazine article calls this a balanced approach. And actually the use of the word ‘balance’ is appropriate. To buy or to build, including through internal recruitment, isn’t a choice – it’s a matter of balance: slightly loading the scales to give a little more focus to buy or build depending upon organisational needs (the main need being either to maintain current performance if things are going well – by tipping the balance towards internal moves - or to provide new insights and perspectives if not everything is so rosy – by tipping the scales the other way). 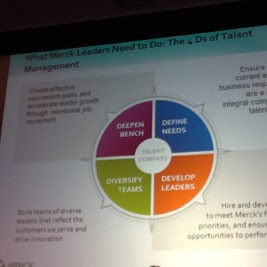 Doing both is also central to the concept of integrated talent management which I’ve been blogging about here. You can also think about there being a similar need to integrate recruiting within HR as there is for integrating learning into HR, which I presented on at Learning Technologies earlier this year. However, if this is all I said it’d be a rather boring panel. So I’m going to be coming down on the side of talent development. And I actually find this a rather easy argument to make – talent development is simply a more strategic activity than talent acquisition is. 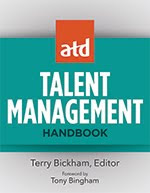 Talent acquisition provides our undeveloped people – our raw materials if you like (OK, neither do I, but stick with me for a minute). The quality of these raw materials is hugely important but it’s just not enough. The even more important activity is what the organisation does with these raw materials – how it converts these into something more useful for the business to use. There’s a direct analogy to the business value chain. Businesses also buy raw materials or other inputs and then transform these into something more valuable which can be sold to customers. Procurement is therefore a vital activity, but even with advances in areas like supply chain management there are very few businesses which compete on they way they procure raw materials. Most do this on the way they add value to these materials through some transformation. Organisations don’t compete on the way they do recruitment either. They compete on the transformation of their new joiners into an aligned and engaged workforce. Much of this transformation is down to the role of talent development, including the way that people are progressed up and across the organisation. And the need to focus on the transformation rather than the raw materials becomes ever greater then more we focus on competing through organisational capabilities. That’s because competition rests upon differentiation. If we recruit the same people as our competitors, if we have the same culture as them, we simply can’t compete upon these things. And OK, it may be possible for one organisation to recruit better or different people simply based upon its employer brand or the speed of its recruiting activities etc. But the difference is likely to be quite small. The key difference is much more likely to come from the transformation of the people we’ve hired and the creation of organisational capabilities we can use. You’ll be able to read more arguments for and against this perspective on the Monster Thinking blog leading up to the debate. A final note: I hope I haven’t offended any of my readers in recruitment! As I noted earlier on, this is a rather theoretical debate. We need both recruitment and development and the real need is to have them both better integrated together; both focused on achieving the same thing – and for both of them to be doing this more strategically. 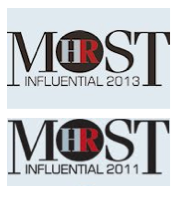 Strategic HCM has once again been selected as a top HR blog to watch for 2012. I’m particularly honoured by this as the listings show me finally catching up with Laurie Ruetimann’s blog that she stopped writing three years ago – it doesn’t get better than that, (LOL)! 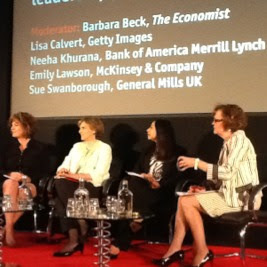 I’ve already posted on some of the morning session’s from last week’s Economist Talent Management Summit. After lunch I was due to moderate a panel featuring Ryan Blair but he didn’t show up, so Lucian Tarnowski stepped into Ryan’s shoes, I stepped into Lucian’s, and Robert Guest, the Economist’s business editor stepped into mine. The session was designed to consider how organisations can build, manage and retain leaders from gen y / the net generation who are more mobile and eager to self-develop than any previous group. I’d have enjoyed moderating the discussion but didn’t feel so comfortable inputting - as you can probably tell from the photo, I’m largely unconvinced by a lot of what is talked about gen Y (or in Lucian’s terms, Gen Why?). In my view, and experience, there definitely is something about gen Y which is different from other generations, and isn’t just about their stage of maturity. But many of these characteristics are shared by others outside of this population (desire to make a difference, propensity to collaborate, use of social media etc – me, me me!) – it’s just that gen Y are showing these characteristics earlier on. Eg when I was a junior consultant at Andersen Consulting (Accenture) I had one Partner who made me stay late in the office, sometimes standing up my friends to do so (this was in the days before mobiles)*. I don’t think gen Y employees would put up with that today and nor should they have to. However, I do sometimes think that they’re lucky to live in the times that they do. 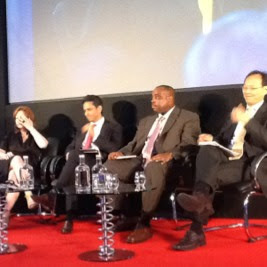 I also think we have to be careful about talking about gen Y as a global category. Due to social media etc, gen Y may be more similar around the world than previous generations, but they’re definitely not the same. I also believe that a lot of gen Y’s more narcissistic tendencies have been reshaped by events over the last couple of years. Eg, and I felt a bit exposed saying this sitting next to the man from the Economist, but I risked sharing statistics on Greek and Spanish youth unemployment (both over 50%) to suggest that in many ways this is the new lost generation and that they’re not that lucky at all (and we haven’t even begun to consider the state of the planet that Doug Baillie mentioned). A generation’s characteristics may be mainly shaped by the experience during their teenage years, but you don’t live through the shocks of the last half decade without it leaving an impact on you, whatever age you are. * Gary Kisler – I’m talking about you!!! ** OK, OK, I know this isn’t where gen y tend to hang – but it’s better place than most to experience what social media is really all about. I've just finished a session talking about next gen talent with Lucian Tarnowski from BraveNewTalent where I did my usual thing of encouraging more of the HR people here to get involved in things like social media themselves. And I'm back blogging again for the afternoon. This first session is on strategic workforce planning and particularly on building effective talent pipelines. First up Christ Benko from Merck talked about how business is changing, leaders need more international experience and the company needs to focus on these key people - they can't afford to invest in everyone to the same extent anymore. Asked whether companies need to invest in their staff when they can buy them from outside, Phillip Snalune suggested that organisations need to do both [interesting, given an event with Monster I've got coming up in July! - more on that here soon]. Melanie Long from SHL suggested they often find clients are surprised how much runway they have inside their organisations. So there's a need for earlier development, better development planning etc. 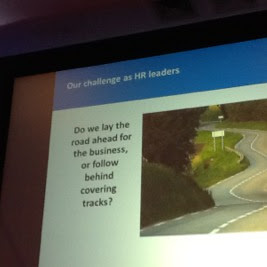 And what about HR - what competencies do HR business partners need to support this? Some of the suggestions were ability to engage the executive to drive the agenda and direct their attention appropriately (it helps if the CEO has had or is having good development experience themselves, eg by sitting on other company's boards). Increasingly, HR needs to be able to take advantage of tools like analytics and semantic search too. This is the session I've been most looking forward to. If talent management is going to shift, given our business challenges, and the move to next gen leadership etc, then HR is going to have to change too (my words). - Lesley Wilkinson at Citi. Lesley talked about Citi's increasing focus on diversity to match their customers and support innovation, and how this is then enabled through their recruitment etc. Another aspect is offering people something to connect to - so Citi focus on people and community as well as shareholder value. Hays are emphasising the digital skills discussed by Unilever and PepsiCo already. And they're trying to respond to the changing expectations of the next gen talent who think about careers in a very different way to how James did when he started his career. We need to be clearer about what companies offer and what value an individual can get from this for their career. Budaraju suggested the average tenure in India is rapidly coming down. The average age of CEOs is coming down too. Something about Indian culture too - I missed this. We need to help people manage their insecurity. We tend to focus too much on closure and not enough on the process of closure. This is about values of trust and respect. Tata are training their people on human relations through 'human process labs'. Although this was a great session, I thought much of it got stuck in the prevailing thinking about 'business-oriented HR', with eg James stressing the need for HR to understand the business very deeply eg new business models etc. [Yes - but we need deeper skills in psychology, sociology and anthropology etc too] and Budaraju emphasising the need for HR people to work outside of HR. Eg Khurshed noted that next gen talent are desperate for something more human. Well they're not going to get this if HR turns its back on this need! It's one reason I'm not generally a fan of appointing CHROs from outside of HR (as per Doug Baillie). But that only applies if HR remain people focused - not 'business person first, HR second'. 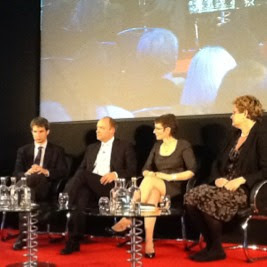 But today I've got a full day of 'next gen talent' at the Economist's annual talent management summit. We're kicking off with a keynote from Doug Baillie, Unilever's fairly new CHRO (and new to HR) sharing his secrets of aligning the development of high-potential talent pools with overall business goals. So Doug's starting off talking about Unilever's business strategy - and how they place HR in the middle of it. It's another early mention for social media - which we'll be talking more about in the panel on 'next gen' that I'll be chairing later. The question which keeps Doug awake at night is where does he find the talent to double their business? A critical element of this is having a strong employer brand - especially in the emerging and developing world. But leadership development is probably the most critical thing they need to do - helping their leadership to lead in a very different way - engaging everyone working in the organisation. They spend a lot of time putting people into boxes and ranking them. 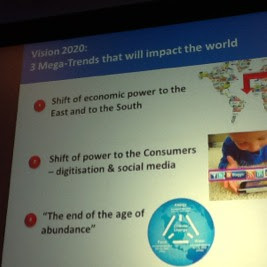 Eg Doug's talking about the next gen wanting fast change between consumer products, investment banking etc etc. Well OK then, which investment banks is Unilever talking to to share some of their next gen resources? And as well as the main technology conference , there are several different break-out shows including ‘Social Enterprise’ moderated by Stowe Boyd and featuring Luis Suarez from IBM, Andy Boyd from Shell and Nicolas Rolland from Danone. There’s also ‘Next Gen Talent’ which includes Nick Holley from Henley arguing that most talent management is an irrelevant and Heiko Fisher on why your company should look like a Burrito! The dates are 25 & 26 October, it’s at the RAI in Amsterdam and I hope that I’ll see you there. Sorry for the lack of posts last week but I was away and didn’t manage to get any posts prepared early. And why was I way? – well in case you didn’t notice it was the dear Queen’s diamond? jubilee last week. That meant we all got an extra day’s bank holiday, delaying the UK’s exit from recession. And also I really didn’t want to be around. Organisational culture: the system reinforces the belief that people progress based upon birth or luck rather than by skill or hard work. I don’t think it’s any accident that the US’ republican culture produces such a higher proportion of entrepreneurs than the UK. Organisation design: the system of princes and princesses, lord and ladies, dukes and duchesses etc may not represent the way real work gets done but it’s still an important shadow system. It may provide a source of fascination for tourists and my six-year old daughter but removing it would bring the top and bottom of our organisation much closer together and provide a much needed boost to social mobility. Performance management: one of the main reasons people seem keen to keep the monarchy is that the Queen is doing such a good job. And I’ll admit that she is, but I really don’t think it’s that hard to do (and half of the time I don’t think it’s her arm waving anyway!). OK, she doesn’t get much holiday, but then with all of that travel and horse riding – never mind the water ski lake at Balmorel! – does she really need one? Recruitment – this is the crux. The Queen may be doing OK but do we really want to leave the nation’s fortunes down to this particular family? Elections may not be perfect either but at least you’re not tied to the same person for their lifetime. Catching up on the news (though I don’t think the papers’ or even the BBC’s coverage always counts as such), despite the heavy rain, there do seem to have been a lot of people celebrating, but is this just because 2m people (including most of the republicans?) deserted the country instead? And anyway, I’m all for a good party – but surely there are more constructive and important things to celebrate? Lovely day today for the first day of June – just the jubilee to get over (more on that soon) and then a busy and entertaining month ahead – including the Economist’s Talent Management Summit on 14th June. “Great challenge Jon. I'll answer with a mixture of what we're doing and what we have plans to do. But firstly my approach. I don't see the question that we're trying to address changing - i.e. balancing 'what does the organisation need', with 'what's right for the individual'. But I do see rapid change in the available toolset. I try to triangulate (my favourite word of the moment) across the 'science', 'art' and external best practice in Talent Management to ensure that we continually evolve to have an agile approach. The Science: we're making good progress on getting the right systems in place. 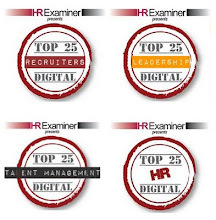 I continue to be impressed by the likes of SuccessFactors and Rypple and we're seeing increased interest in what big data implications are for HR. For me this is about timeliness, accuracy and point-of-need; giving Line Managers actionable information at their fingertips, and reducing noise/complexity. The Art: this gets to the heart of your question and I think this differs very much company-to-company (depending on that lazy c-word, culture). What is the common Talent language and how are decisions made?. I see a continued tilt towards the 'art' of talent management (as opposed to the science) in more relationship-based orgs, where perception/judgement and the subtleties of influence are more important. I wonder if we'll see roads towards the science of measuring that, perhaps an internal organisational Klout score? I'd also suggest that increased focus on building a truly diverse reflection of global footprint is accelerating the need to answer these questions. When it comes to how we think, the concept of 'unconscious bias' is proving a useful conversation. So.... I try to THINK in 3-D (triangulation), ACT quickly, simply, based on timely information, and BEHAVE responsibly, confidently and with integrity. Love it – and I definitely think there’s going to be a big focus on aligning talent management with organisational influence rather than individual contribution over the next few years. More about that on this blog again soon as well. And if you think you can do better? – there’s still time to post your entry (the deadline has been extended till the end of the weekend). Picture credit: Picking up on Keith’s cue, I tried to use Twiangulate for him ( @kjw_hrd ), the Economist ( @EG_LeadershipTE ) and myself ( @joningham ) to analyse our relationships but it didn’t tell me that much – other than Keith doesn’t use Twitter as much as he does Linkedin!